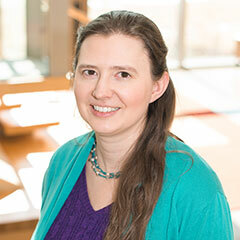 Dr. Baker is interested in computational applications of solid mechanics and numerical methods, including applications in pharmaceutical processing and explosives. Her Ph.D. work at Purdue University is in computational methods for analyzing particulate and granular systems at high confinement. She has developed a time integrator using a recent reformulation of angular orientation, and used it to analyze diametrical compression of compressed granular tablets, as well as impact tests on plastic-bonded explosive formulations. She has also contributed to the nanoHUB network of simulation tools for researchers and educators, mentoring students and contributing to the codebase. She is married to her husband Christopher, a program analyst for the Indianapolis VA. In her spare time, she enjoys crocheting, playing the piano, dabbling in language learning, and being annihilated by her husband at board games. Dr. Baker has served at Anderson University since January 2019 and is a member of the American Chemical Society.